The earliest types of necklaces were made from organic materials such as shells, teeth, and bone beads. 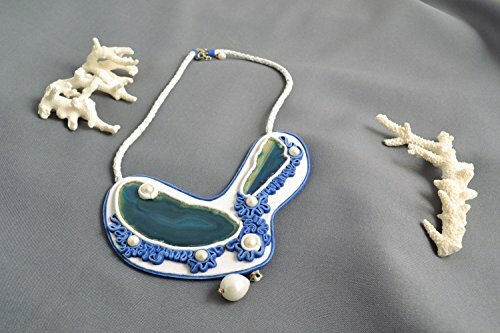 Ethnic necklaces made of precious organic materials like coral were meant to display the woman’s or her family’s wealth and are usually worn during courting rituals or at weddings. Necklaces became part of both men and women’s dress code during the Middle Ages and became the primary piece of jewelry in the late Gothic and early Renaissance periods. In the 14th to the early 17th centuries, necklaces with gemstones as well as gold chain necklaces with pendants were worn to indicate one’s social status and prestige. Necklaces only became a feminine item beginning in the 18th century when it was worn together with a matching set of jewelry such as brooch, earrings, bracelets, and a pendant or tiara. Like its name implies, a bib necklace covers you up in the same area a bib does. This type of necklace is very trendy right now, and if you are interested in putting away your winter scarves, but still wish to have some decoration on the front part of your blouse, bib necklaces are perfect. These bold, chunky necklaces can be made of metals, such as silver or gold, and you can make them in many different sizes and colors as well. Picture a long necklace that covers the upper part of your chest and is made with a combination of white gold, yellow gold, and rose gold mosaic-type pieces, because necklaces such as this can be easily found in numerous stores. You can also make a bib necklace out of beads and even crystals, so when you are shopping around for the perfect bib necklace, you are likely going to be very pleasantly surprised by what you find. Anchor chains: double links in a uniform size and which look sturdy and heavy. Bead chains: small metal balls that are attached together by some type of wire. Box chains: each link is a box shape, and they come in various sizes. Byzantine chains: these links are interlocked and create complex patterns. Cable chains: with a simple design, cable chains have oval links that are flat and upright. Curb chains: also called Cuban chains, the links lie flat and can be wide or thin. Figaro chains: a pattern of one long, oval-shaped link interspersed with two or three smaller links. Heart chains: as their name suggests, these consist of elegant looking, heart-shaped links. Omega chains: instead of links, these chains consist of metal plates that are pieced together and strung on some type of wire; they are usually flat and smooth. Popcorn chains: consisting of circular links that have the appearance of hundreds of small beads pieced together. Rope chains: consist of small links twisted together to resemble a rope. Singapore chains: their links are flat, but have a complex and curved appearance. Snake chains: their links are either Z-shaped or S-shaped and create a very smooth look. Wheat chains: made of flat oval links that create a complex pattern resembling pieces of wheat. One of the biggest advantages to choosing a choker necklace is that no matter what their color or design may be, they always go with everything you wear, regardless of why you are dressing up in the first place. Chokers are normally 14 to 16 inches in length and worn close to the neck, and the best part is, they will complement any type of neckline you have. You can wear them with jeans or a formal dress. Whether you are going to a cocktail party or a business meeting, your choker will help you look and feel amazing. In addition, since chokers include both necklaces that fit flush against your neck and those that hang down just a tad bit further, you have a lot of choices when it comes to the one you select. They can be made of leather or gold, velvet or thick string, and they can be as casual or as formal as you like. When it comes to chokers, there is no end to the numbers that are available, so if you need one for any occasion, there is no better time than right now to start shopping. Collar necklaces go great when you’re wearing off-the-shoulder outfits, turtleneck sweaters, boat necks, or V-necks, and they are often called crewnecks because they fit around your neck just like crewneck tee-shirts do. Collar necklaces are short, only 12 to 13 inches in length, and they are often made up of three or more strands of pearls or other materials. The necklace encircles your neck right around the collar area, hence the name, and one of the best parts of choosing this type of necklace is that it can be formal or casual, depending on what you use to make it. Collar necklaces look stunning when made of pearls, beads, or different gems, but you can get a more casual look if you choose plain strands of silver or gold. No matter what look you are aiming for, you are all but guaranteed to find a collar necklace to achieve that look. Like its name suggests, this necklace is a single-strand necklace usually made of materials such as beads, and the beads are small starting at the clasp but get larger as they get to the other end. Regardless of the length you choose or the neckline of the outfit you are planning to wear, you will look extravagant and elegant in a graduated necklace. They usually look better if the beads are all the same color, but this is not a necessity to make sure the necklace looks good. There are also necklaces that have several “layers” of beads, and each layer gets a little further down the blouse or shirt you are wearing, and these can be considered graduated necklaces as well. Graduated necklaces look great for both casual and formal events, although they look absolutely exquisite with more formal attire. If you know what a lariat is, you can picture what a lariat necklace looks like. Designed with no clasp points, the lariat necklace is a scarf-like neck piece that wraps around the neck and has just one strand hanging down the other. It can also include a knot over the chest part, and it is sometimes called a lasso necklace because of its design. If you look at the necklace after you’ve put it in, it often has a Y shape to it, and in some cases, the bottom part will have a pendant or charm attached to it to give it an even better look. Perfect especially for U-shaped necklines, the lariat necklace is great for both casual and formal occasions, so whether you’re going to a company picnic, a board meeting, or a night on the town, make sure you wear your lariat necklace so that you can enjoy the style and elegance you deserve to enjoy on that event. Used mostly for women who are wearing a plunging neckline, the matinee necklace sits right above the bust and is normally between 20 and 22 inches in length. They are most often embellished with beads or stones, and if your neck is extra-wide or you have a fuller bust than most women, you may want to choose a matinee necklace. It has a pendant, just in case the 20-inch necklace feels too tight. Many women love this style of the necklace because of its length, which is not as short as a choker but not as long as other types of necklaces. It truly is the perfect length, usually landing close to the bust, but no longer, which means it will also never get tangled or in the way. Best of all, matinee necklaces can be worn almost anywhere, especially because they are made out of so many different materials, making them a great go-to piece of jewelry for everything from barbecues to wedding receptions. A necklace made of multi-colored beads looks good with almost anything, especially if you’re wearing a blouse or dress that is white or light in color. The necklaces can be made of beads of all sizes, although if you use multiple strands, the small beads, called seed beads, usually look best. Whether you’re going to a beach party, brunch, the movies, or shopping, these stringed necklaces can help you be the life of the party, and you can choose beads of the same color or in a multitude of colors. If you are preparing for a Fourth of July party, you can choose a necklace in red, white, and blue; and if you are attending a Christmas party, you can find one that is red and green. With these types of necklaces, the sky is the limit, so finding one you will love is a lot easier than you think. Perfect for dresses with blouses that have deep necks, opera necklaces are usually between 26 and 36 inches in length, and if you prefer a bit of drama with your jewelry, the opera necklace is the one to pick. This is a versatile type of necklace that is usually worn to very formal events, hence the name, but the necklaces are so attractive that they can be worn almost anywhere. One of the biggest advantages to choosing an opera necklace is that, other than the length, no two necklaces are the same. You can wear the necklace as a single strand if you want a high necklace, or double it up so that it looks like a two-strand choker. Opera necklaces can also be worn knotted up at the necklace for a more classic, vintage look and for events such as cocktail parties and other evening fetes. They are made with everything from pearls to beads, and nearly anything else you can think of, making them a great item to have in your jewelry box. Plastron necklaces are heavy and cover the area just above the bust, and they can easily add some ambiance to any type of outfit you are wearing. They are almost always a solid necklace, but they can be made of wood, silver, beads, or even glass. Once you start researching plastron necklaces, you will understand why they are so popular nowadays, and, much like princess necklaces, wearing one makes you feel like a million bucks. Plastron necklaces can be gold or silver, turquoise or glass, light or dark, thick or thin, which means whether your occasion is small or large, fancy or casual, you can find one of these necklaces that will complement whatever you are wearing that day. Because of its regal look and the fact that it is normally made very fancily with beads and gems, the princess necklace is a very popular and common type of necklace. It is usually between 17 and 19 inches in length, and it is available in both light and heavy designs. It is truly a necklace that will fit any occasion, so if you are wearing a suit or dress, you can choose one that is lighter in design, while a heavier necklace will work best should you wish to add a little pizzazz at a wedding or other special event. Much like the name implies, these necklaces look just like they were fit for a queen, and whether you want one in gold, silver, or beads that are in colors such as navy blue, burgundy, royal purple, or bright teal, you can easily find the perfect necklace in the end with only a small amount of effort on your part. Necklaces made of multiple strands of strings are beautiful and have a simple, yet elegant look. If you choose strings of various colors, the necklaces are even more attractive. Perfect for beach parties, matinees, and brunches, you can easily be the center of attention with multi-stringed necklaces that are made in more than one color. The strings can be made of just about any type of material, including strings of beads, silk strings, leather or waxed linen cord strings, beading wire, and even hemp. You can insert beads or gems on these strings, or simply use the strings themselves if they are unique enough. String necklaces can also come in a variety of lengths, and you can even purchase single strands and wear them together for a particularly attractive look. Finding a multi-colored necklace means you will have one that matches solid light- or dark-colored shirts and blouses, and they are also perfect for both casual and more formal occasions. Putting tassels at the end of various types of chains is nothing new, but these types of necklaces have gained in popularity in recent years, in part because they go with everything from t-shirts to silk blouses. Tassel necklaces make a bold statement and can be made of various materials, including gold or silver chains, beaded chains, and even a thick corded material. The tassels themselves can be made of gold or silver chains, basic strings, feathers, and even embroidery thread. This means the necklaces come in a variety of sizes and colors, so they go great with both casual and more formal occasions. If you are looking for a necklace to go with a casual dress or a blouse, thread necklaces are a great choice. They are extremely stylish because there is a wide selection of items to place on the thread you have chosen, including silver pendants, large beads, and items in silver, wood, or even metal. Thread necklaces are usually between 14 and 20 inches long, and the threads you use are thick and usually tied in a knot at the neckline, meaning you will not have to use eyelets or any type of finding to clip the necklace together. They are also perfect for those days when you are not sure which necklace to wear, because they go with everything; the threads come in different colors, which means whether the blouse you are wearing is soft yellow, bright teal, or plain white, the necklace will look stunning with it. Thread necklaces are good, multi-purpose necklaces that go great with jeans and dresses, blazers and tunics, and they are very simple to make yourself, should you wish to do so. 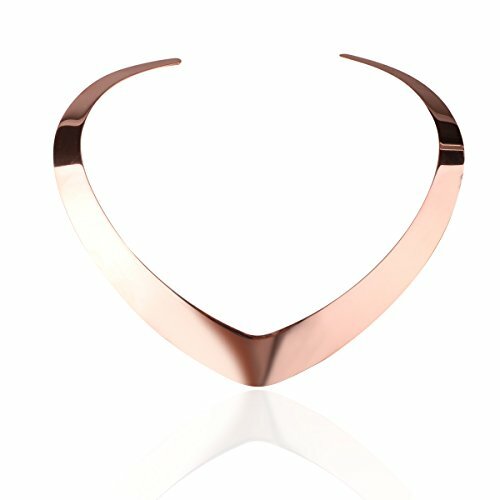 This is a unique type of necklace that is becoming more popular all the time. Instead of being open in the back towards the neckline, the torque necklace is open in the front, but it has no clasp or other closing device. It is a solid necklace that is worn close to the skin and is usually made of metal. The torque necklace has a spherical shape, so its ends are made imposing. The necklace is very contemporary and chic, and regardless of the outfit you are wearing it with, it will catch the attention of everyone around you. Especially attractive with more formal outfits, the torque necklace has a one-of-a-kind look that you will be happy to show off to your friends. 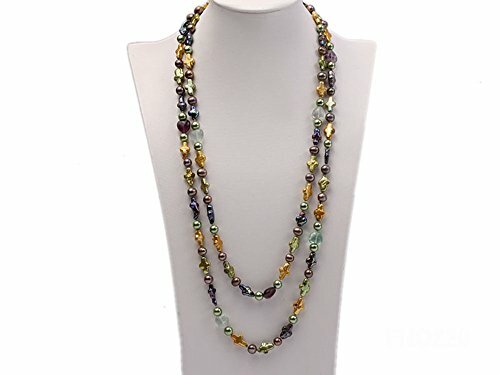 Unlike other bead necklaces, these necklaces are made with multiple strands that are twisted around to give it a very unique look. You can also use a variety of materials to twist around, including not only beads but wire-like strands as well. Instead of just a single layer of beads or wires, there are several layers with this necklace, and you give the necklace a slight twist before putting it on. Twisted necklaces can also come in various lengths and may even have a charm at the tip of the necklace. When it comes to these necklaces, nothing is too decorative or fancy for them. Moreover, once you purchase your first twisted necklace, you are all but guaranteed to come back for more of them in the future, because most women absolutely love them. One of the most amazing things about buying necklaces made of beads is the selection that is now available. Beads are usually made of plastic or some type of acrylic, and they can be very tiny, with the smallest ones being called seed beads, or very large in size. They can also come in materials such as metal or wood, as well as gems and crystals, and they come in various shapes as well. Beads have been used for making jewelry for over 3,500 years, and the necklaces have even been used in various rituals all over the world. Of course, the main advantage of choosing necklaces made of beads is that you can easily find something you love regardless of your personal tastes and preferences because bead necklaces truly offer something for everyone. To make things even more interesting, bead necklaces are items that are very easy to make yourself, even if you are a beginner when it comes to beading, which means it is easy to make yourself numerous necklaces that match everything in your wardrobe. Although a lot of people don’t think about this material when making necklaces, the fact is it is very practical for two reasons: the yarn used for knitting and crocheting is very strong and inexpensive to buy. You can research patterns or make up one yourself, and if you would like to add other elements, such as beads, it is an easy thing to do. Most importantly, crochet yarn comes in so many colors, textures, and designs that you can make the fanciest or the most basic necklace in no time. There are a lot of websites devoted to making necklaces out of crochet yarn, and whether you want to make one to match a silk blouse, a linen blazer, or even a tee-shirt, it is easy to find something extraordinary every time. If you choose to forgo the process and simply buy one instead, you’ll be able to find a necklace in any color and design you wish, and because they are so inexpensive to purchase, you can easily get more than one so that they will match anything in your closet. This is perhaps the most common material for necklaces, but the higher the quality of gold or silver, the higher the price will be, which is why these types of necklaces are not sitting in everyone’s jewelry boxes. You can choose yellow gold, white gold, rose gold, platinum, sterling silver, and more, and you can get the gold in 10-karat up to 24-karat. Regardless of your budget, you should be able to find something you love. Gold and silver necklaces come in dozens of sizes and designs, and they are often made with gems such as rubies or emeralds for an even more elegant look. Although few things are more attractive than a solid sterling-silver or yellow-gold chain hanging around someone’s neck, you can get a lot fancier than that if you want to; because so many jewelry stores now offer custom-made necklaces, you are all but guaranteed to get something you love every time. Leather strings come in so many different widths, textures, and colors that you might be surprised by the selection that is now available, and if you choose to buy a necklace made with a leather string, you can find them holding pendants, charms, beads, and dozens of other items to dress them up and make them look amazing. Leather necklaces can be fancy or casual, depending on the items you attach to them, and the best part of it is, leather is strong enough to guarantee that the necklace will last you for a very long time. Place some beads and a peace-sign pendant on it for a hippie, modern look, or add delicate beads made out of crystal or some type of gems for a very different look. Shopping for these types of necklaces is easy, and you will always be able to find something that is perfect for you in the end. 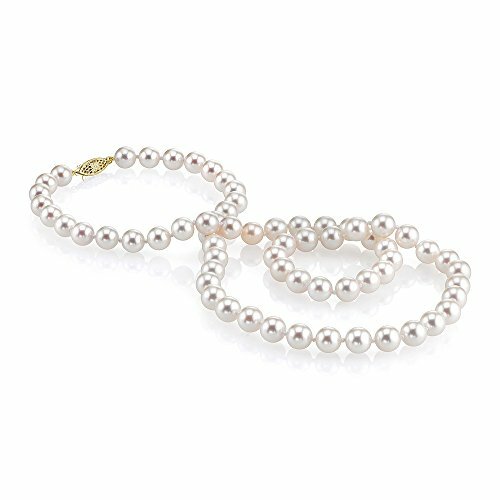 When you think of elegant necklaces, you likely think of pearl necklaces first. Both real and faux pearls come in a wide variety of sizes and even colors, and the old adage is true that most people are unable to tell the difference just by looking at or touching the pearls. Pearl necklaces can have single strands or multiple strands of pearls, and you can buy them with pearls that are white, off-white, and even light pink. The pearls can be small or large, and since the necklaces come in numerous lengths, it is easy to find the one that is right for your lifestyle. These days, pearl necklaces are worn with business suits and cocktail dresses, as well as tee-shirts and cotton blouses. Regardless of how casual or fancy the event is, a pearl necklace can easily complement the look of your outfit, and once you purchase your first one, you will likely wonder why you had not done it in the past. Jewelry lovers don’t have to spend a lot of money on gold jewelry. Different sizes and weights of gold exist, from 10 karats to 24 karats, and even though the lower sizes are cheaper, they are still high in quality. In addition, there is now a type of gold that is very inexpensive but looks pricey, and it is called vermeil. Pronounced ver-MAY, this type of jewelry looks like solid gold, but instead, it consists of a thin layer of 10-karat gold that covers a base of sterling silver. Vermeil is amazing because to the average person, it looks just like expensive gold, yet it is very affordable for almost everyone. Many people are surprised to learn of the various types of materials that jewelry has been made of in the past and even in the present. People have used both natural and man-made substances to make jewelry pieces, including bones, rocks, and pieces of wood. Most recently, jewelry has been made of a variety of metals, including yellow- or white gold, sterling silver, rose gold, platinum, and several others. In fact, past cultures have used glass and even beetles, mammoth tusks, and snail shells to make their jewelry. There is even a type of jewelry known as costume jewelry, and even though these pieces are made of metals and faux stones with the least valuable materials, this type of jewelry serves a very important purpose and is extremely popular with a lot of people, regardless of their tastes and preferences or their budget. The value of gold depends mostly on the purity of the gold. This is always measured in karats, with 24 karats being the purest and 10 karats being the least pure. An item made in 24-karat gold is completely solid and, therefore, heavy and sturdy. All other measures of gold are based upon this measure. A piece of jewelry that is made of 18-karat gold is 18 parts gold and six parts other types of metals. Both 14- and 10-karat gold pieces are extremely popular because they are both affordable and high quality. The average person cannot tell the difference between the various types of gold just by looking at them, but if you are rough on your jewelry, it is best to purchase pieces with the highest karat counts because the lower-karat pieces may be too soft for your needs. Most experts agree that the word “jewelry” has its roots in the Latin language. It is derived from the Latin word “jocale,” which meant plaything in the 13th century. This means that throughout much of history, jewelry has been considered an item purchased to make the wearer feel good and improve his or her image. In ancient Rome, jewelry was associated so much with wealth and power that only high-ranking people were allowed to wear rings. These days, jewelry is also used as a status symbol and to decorate one’s wardrobe, and this is not likely to end anytime soon. How Long Has Jewelry Been Around? It is extremely likely that the very first humans on Earth wore jewelry, which means it has likely been around since before history began being recorded. All around the globe, archaeologists have uncovered items such as beads which look as though they were used as different types of jewelry, including earrings, necklaces, and bracelets. In addition, when these items have been tested, it has been proven that they’ve been around for at least 100,000 years. Diamonds, which were likely first mined in India. In addition, only one in one million diamonds end up being placed in a piece of jewelry. Amber, which comes from fossilized tree resin and it takes over one million years to be officially called amber. Emeralds, which were mined by the Egyptians as long ago as 3500 BC. Kunzite, a pink stone that is known as the “evening stone” and which loses its luster when left out in the sun for too long. Obsidian, a natural type of glass that is the product of a volcanic eruption. Pearls, which are mostly cultured, or man-made, today. It takes a minimum of three years to make this happen. In addition, the largest diamond – known as the “Cullinan” – weighs approximately 1-1/3 pounds. And black jet, which became popular during the reign of Queen Victoria, is the result of fossilized coal that was formed roughly 180-million years ago. When people refer to organic gemstones, they are talking about stones that are made from living organisms and not as a result of a natural geologic process. Examples of organic gemstones include amber, pearls, and coral. In many cultures, both past, and present, jewelry is thought to ward off evil spirits. A great example is an Egyptian ankh. In some cultures in parts of Africa, men wear earrings to show power, masculinity, status, and prowess. In addition, the wearing of jewelry by men, including chains and earrings, which is fairly new in many cultures, is now considered perfectly acceptable all across the globe.